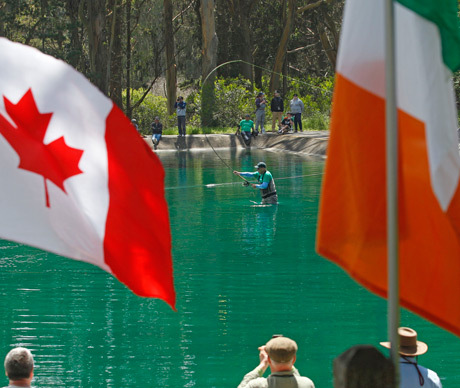 The Golden Gate Angling and Casting Club (GGACC) is pleased to announce the 16th annual Jimmy Green World Championship of Spey Casting to be held from Friday, April 26th to Sunday, April 28th, 2019 at the world-renowned casting ponds located in San Francisco's Golden Gate Park (on JFK Dr. across from buffalo paddock). The GGACC is devoted to introducing everyone to fly casting and angling at their historical club and facility, and promoting numerous casting competitions, including Spey-O-Rama. This event is open to the public and admittance is free. Breakfasts and lunches are available to the general public and club members in the lodge for a $10 fee on Friday, Saturday, and Sunday. Dinner is available on Saturday for a $30 fee. All meals are complimentary to exhibitors and competitors. There will be a $120USD registration fee for each competitor in this year's Spey competition, if you register before March 31st, 2019. As of April 1st, 2019 the registration fee will increase to $140USD. Premium fly-fishing rod and reel manufacturers will have their products available for you to try out at the casting ponds. The world's best casters will practice on Friday in preparation for the Spey Casting Competitions on Saturday and Sunday.